3M Scotch 35 Blue Vinyl Electrical Tapes offer premium grade quality and superior adhesion. 3M Scotch 35 coloured Vinyl Electrical Tapes are highly flexible, stretchy and conformable to virtually any shape. UL LISTED, 3M Scotch 35 Blue Vinyl Electrical Tapes are a great choice for your next project inside or out. Commercial Electric Silver Vinyl Bundling Tape 2 inches x 150 ft. x 6 mil, a specially formulated vinyl plastic tape used for general bundling and binding use. It is environmentally friendly PVC easy tear tape. When removed, this vinyl bundling tape does not leave the sticky adhesive residue that other tapes leave behind. Tears straight and easily both across and along the tape. Lead-free and conforms to irregular surfaces. Good aging resistance and sunlight resistant. Note: not to be used for electrical insulation. The Essential Silicone Protect and Repair Tape. Repair Tape, another innovation from Gardner Bender, can save the day during emergency repairs. Easier than heat-shrink, cleaner than plumbers' putty, and more flexible than a vice grip, Repair Tape is a household necessity. Add it to the tool box, the workshop shelf, and the "junk-drawer" for emergency repairs and maintenance projects. Stretch, wrap, and protect or repair everything from leaky hoses, pipe insulation, electrical connections, tool handles, air ducts, and cord/rope ends. The Klein Tools 25-foot (7.5 m) steel fish tape is great for short wire runs under carpeting, through insulation or over suspended ceilings. The tape features a flat, plastic slotted tip that resists snagging and easily accepts wire attachment. It also features Klein's exclusive descending laser-etched markings. Marked at 1-foot (0.3 m) increments, this fish tape helps measure the depth of conduit runs and lets you determine the amount of tape left to pay out. 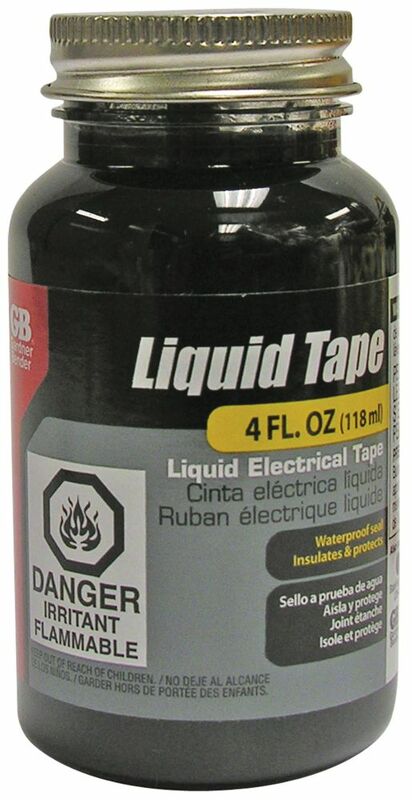 Liquid Electrical Tape, Waterproof Seal, All Indoor/Outdoor Uses, Includes Brush, Black, 4oz, 1/Jar is rated 4.2 out of 5 by 5. Rated 4 out of 5 by DstBstSN from Good impulse I'll admit, I totally purchased this on impulse. While installing a new low voltage lights in my backyard I realized I needed to splice two wires to reach the new transformer. I decided to give this stuff a shot. I soldered the wires together and gave two quick coats with this stuff. Then shrink tubed over the connection followed by coating (globing) more on. The wire has been buried and exposed to some moisture thus far and so far so good. I do wish it dried a little faster, but I'll be the first to point out I'm fairly impatient. Rated 4 out of 5 by CrazyRabbitLady from Repair for daily-use cords My Situation: I have rabbits... lots of them because I run a sanctuary. As much as I establish systems to keep cords above floor level, clever rabbits seem to smell when I pull out tasty and fun phone-charger wires, laptop cords, and various other electric threads. The Problem I Face: Because the rabbits get the portable common cords, my repair jobs with electrical tape inherently take place on items I frequently bend, unbend, twist, and otherwise spindle in the full range of temperatures and humidity inside and outside throughout a year. The Problem with Standard Tape: Electric tape cannot withstand the abuse. I frequently find areas where tape slips and leaves me with sticky dirty wire and failing confidence in my connection. The Benefits of Liquid: Liquid tape has no adhesive side; therefore, sticky residue simply does not appear. It also does not require extreme patience and fine dexterity for separately wrapping multiple small wires in a small space. I find liquid tape lets me twist each pair, dab each pair, let them dry a few minutes, and then glop all pairs together. Also a plus, no rabbit has indicated a taste predilection for liquid tape. Strength Untested: I have happily not had a critical wire to repair recently to test liquid tape's strength through various temperatures and humidity levels. Unfortunate: Until I become a master painter, everything looks gloppy. It is a tradeoff from sticky-dirty tape to gloppy dried liquid. I choose the latter. Rated 5 out of 5 by fastGeorgie from Perfect -Great product Wow.... This saved me. I have headsets I use for NASCAR races and the wires on the cord became exposed... Rather than replace the headset or the cord, I tried this product and it works great!!! Rated 4 out of 5 by MuzX from So far so good I use the liquid tape on guitar wirings and it works well so far. I need relatively small amount and it makes stable coating. My only concern is that it dries slowly, depending on the thickness of the coating sometimes even takes hours. Rated 4 out of 5 by Eddieb from The product is useful for achieving a waterproof low voltage connection. I used some liquid electrical tape in conjunction with heat shrink to make a waterproof 12 volt low voltage lighting connection. So far it has been water tight and worked well for my specific application.